MMORPG.com Industry Relations Manager Garrett Fuller recently had the opportunity to sit down with The Syndicate's Sean Stalzer to talk about The Year of the MMO and what the guild has planned for 2011. Check out what's in the works for The Syndicate and leave us a comment or two when you're finished. For anyone in MMOs who runs a guild or is part of a guild you can relate to the Syndicate. They have made a name for themselves as one of the oldest active guilds as well as working with companies to help support the MMO industry. The best part about the Syndicate is that they are on our side of the fence. They are players first and foremost. I sat down with Sean Stalzer to talk about how the guild has been doing and what they are working on for 2011, the year of MMOs. 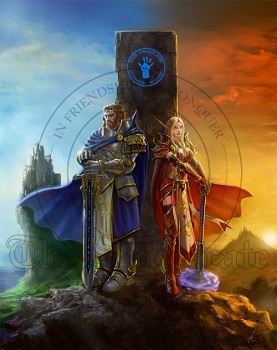 The Syndicate still maintains a presence in Ultima Online and World of Warcraft. They also have groups of players who are active in different MMOs such as RIFT, Aion, Age of Conan, and Warhammer Online. They have been successful in keeping everyone together for a long time and maintain over 1000 unique members. The group is currently working on a second book about guild mechanics and also has a section that includes player expectations. In talking with Sean, he understands the needs and hopes of the MMO player better than anyone. The best is that our conversations are not monitored by a marketing representative who will say, “Sorry you cannot talk about that.” When Sean and the Syndicate work with game companies they do so from a player standpoint, trying to get developers to understand what players expect in online games. A few of the game elements that we discussed have been allowing players to access parts of the game from anywhere at anytime. With the mobile market exploding and browser based systems become more accessible there is no reason an MMO cannot have their players hit parts of the game from anywhere. This is the largest area where MMOs can improve in terms of service. As social media grows, games can follow suit by allowing their players more access points to impact the game itself, or to communicate with their friends or guild members. One area that guilds have been looking towards is a universal Instant Messaging client so players can talk across games. Unfortunately, companies would have to comply with this type of set up, but it would allow guilds to stay together and communicate no matter what game they were playing. Sean pointed to Ventrillo as the perfect example of a service that is used by his guild across games. If a voice service can be set up, then why not some form of chat so players can message each other from anywhere. These types of services would support player bases beyond the games they play. One of the largest areas of change that The Syndicate is considering is in guides and online access. Sean talked about breaking down game guides in their current form as they are mostly released at launch. Well, for many MMO players launch is over in no time and they are on to new content. Sean talked about breaking game guides down into different areas and having them accessible to players in different sections. Instead of buying a full guide, you could buy parts of a guide that you really need. How many times have you been stuck on a boss and been forced to look up information on that boss alone. It happens all the time. A giant guide is not going to give you what you need in the moment. The Syndicate is working on building these style game guides to give fellow guilds the tools they need to sole their raids. This idea sounded really promising and hopefully we will see this type of set up in the future. Sean is a great player and running a guild of 1000+ members for over 15 years is certainly a feat. The best part about the Syndicate is that they truly understand what players go through in MMOs. They are fighting the battles with developers so that they can meet player needs and work on making a better game for all of us. If you are ever at a conference and see Sean on a panel or at a booth, definitely take time to chat with him. He is definitely one of us, a player. Hopefully the developers will continue to listen to him.